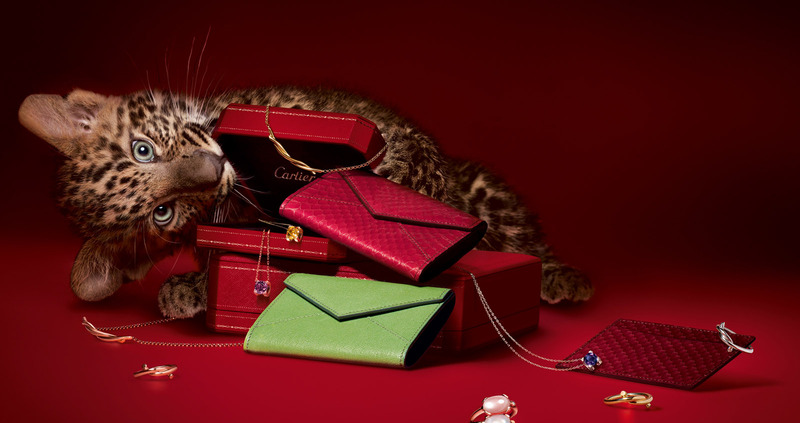 This classic, stunning design from Cartier is a prime example of why they are one of the biggest names in the business, and certainly, one of the most luxurious, well thought of names. Made of 18K Yellow Gold, The Cartier Santos Demoiselle, W25063X9, is a classic, stylish design that has no exceptions when it comes to its accessory possibilities. 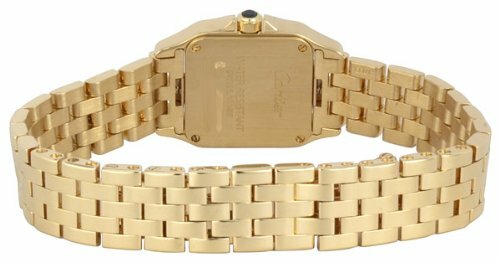 Feminine in its rectangular shape, yet sturdy with a thicker band and tightly woven 18K gold links, this watch is perfect for the businesswoman, the diva, the type A and the retiree. It is versatile, but not lacking in stunning beauty, and subtly luxurious. With a 18K yellow gold case and band, and a scratch-resistant sapphire face, this watch is durable indeed – but not without delicate accents and flair. The blue sword-shaped hands are a beautiful touch, and the 1-12 Roman Numeral indicators are a classic aspect of the Cartier design that add some traditional aspects to the watch, or depending on the purchaser – a nice vintage touch. The set gold Bezel is a rectangular shape with soft corners, adding a nice feminine curve to this basic shape. 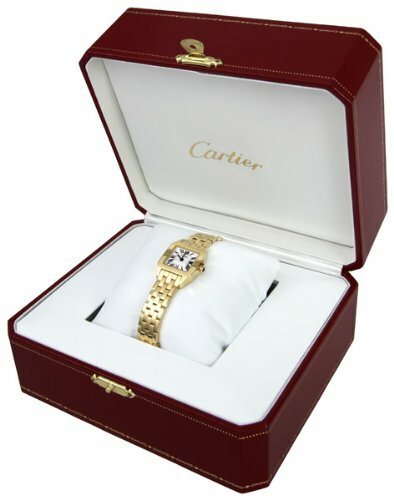 The function is battery operated Quartz movement, and the whole thing comes together with a hidden deployment clasp – another original hint at Cartier’s brilliant design. The watch has a jewelry feel without seeming too delicate, and this watch could certainly accompany business suits as well as jeans – but wouldn’t be out of place out at night. Though this is certainly a stunning watch, the value lies nearly all in the material the watch is made of, which for some, could be a downside. The watch has only basic features – hours and minutes – and doesn’t include a calendar or stopwatch feature, something that is a given with almost every men’s watch. The face is fairly small as well – giving the Roman Numerals a crammed feel. The watch, is of course, made entirely of 18K Gold – and for some, that may be enough. It is available online through most American vendors for prices between $12,000 and $16,000.